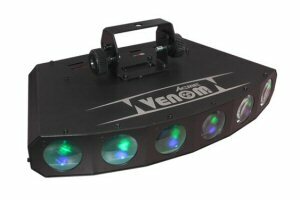 The Acme Venom is powered by 6 X 3W pods of tri-coloured LEDs housed in a lightweight, robust housing. Thick, crisp, round beams of colour sweep across the floor or walls. Each pod can be individually controlled for amazing colour chases, sequences and effect combinations. The best effects can be achieved in master/slave mode. The master and slaved units can run as mirror images of each other as well, allowing you to make complex looking shows and effects with just the touch of a button. The Venom can also be sound activated or run using its built-in automated programmes.